Grip and stretch trainings strengthens the fingers, wrists and forearms. Improved grip strength produces faster results in the gym because you can hold heavy weights. The grip strength, according to the American Council on Exercise, is especially important for sports such as climbing and gymnastics, which often require you to support your own body weight with your grip. Grip and stretch exercises can be also used to build the fingers independently. Musicians like violin and guitarists need the ability to apply pressure with each individual finger. To build individual finger grip you can use finger stretchers and hand grips. Improved finger dexterity also helps to improve typing. How can I ease hand and finger joint pain? Great as a hand therapy equipment and flexing the extensor muscles of the hands. Best for preventing hand fatigue, arthritis, strain, and early signs of carpal tunnel. COMFORTABLE DESIGN - Bigger finger holes and durable finger trainers. Designed ergonomically for all hand sizes. Keep them in your bag, pocket and use any where any time. 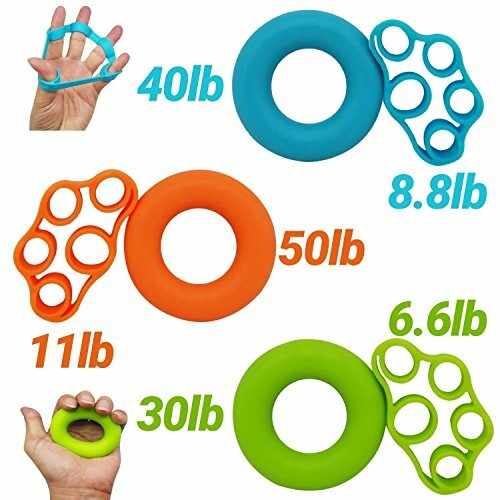 3 LEVEL FOR YOU - Includes 30 lbs, 40 lbs and 50 lbs Hand Grip Ring and also 11 lbs, 8.8 lbs and 6.6 lbs Finger Stretcher Strength Trainer and Expander. You can start with low levels and increase your strenght through tougher levels. FITNESS & SPORTS - YiCare Grip and Stretch trainings strengthen your fingers, wrists and forearms. Improved gripping strength helps you get faster results in the gym and make you able to hold onto heavy weights. REHABILITATION & RECOVERY - Help you recover your muscles after hand and forearms surgeries. YiCare Trainers also perfect help for the treatment process. SATISFACTION GUARANTEE: We rigorously test our Trainers to ensure the quality and performance meet your expectations, but if you're not happy for whatever reason, FREELY contact us for full refund. If you have any questions about this product by BORUD, contact us by completing and submitting the form below. If you are looking for a specif part number, please include it with your message.